The American Jazz Museum serves as a repository for priceless, rare, and one-of-a-kind artifacts, documents and photographs, film and sound recordings, published books, sheet music, and visual art pieces that inform our understanding of jazz as a historical and living art form. The Museum provides access to artifacts, photographs, and documents that showcase the life and work of America’s jazz musicians and the impact of jazz on American society and culture in general and in Kansas City in particular. Among the artifacts are musical instruments of all kinds, including Charlie Parker’s Grafton saxophone, Claude ‘Fiddler’ Williams’ violin, and Ernie Williams’ bass drum. The collection also contains many personal effects of jazz musicians, including performance contracts, handwritten correspondence from John Coltrane and Pearl Thuston-Brown, performance outfits worn by Ella Fitzgerald, and Charlie Parker’s gold pocket watch and cuff links. The holdings also contain a vast collection of photographs, posters, and jazz related ephemera. Also among the artifacts are evidence of technological developments in sound recording, from the Edison graphophone to mid-century and modern radios and turntables. The American Jazz Museum is also home to the John H. Baker Film Collection. 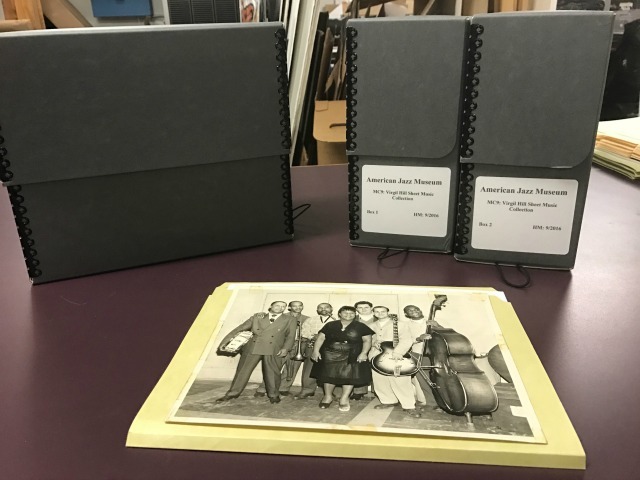 The collection is comprised of over 2000 rolls of film, as well as photographs and other materials, and provides an astounding visual record of jazz performances. The Museum maintains an ever expanding music library of sound recordings on phonograph cylinders, vinyl records, reel-to-reel tapes, cassettes, and compact discs capturing the evolution of the art form from the dawn of recorded sound to today’s jazz masters and up-and-coming stars. The music library also contains a wide array of sheet music covering jazz compositions and other genres as well as books and other unique publications that provide insight into the nation’s jazz history and the social and cultural life of Kansas City’s jazz scene. The American Jazz Museum’s art collection includes the work of nationally renowned visual artists working in a variety of media, including painting, photography, and sculpture, with particular focus on pieces that celebrate jazz, jazz culture, and the African American experience. Among the Museum’s pieces are works of muralists Selina ONeal and José Faus, photographer Robert Hale, and print artist Curlee Raven Holten. The Collections Department is excited to provide access to collections to jazz scholars and researchers. To schedule a research appointment or inquire about accessing an artifact digitally, please contact us. We welcome the opportunity to consider offers of collection donations. Due to the volume of offers we receive on a weekly basis, the Museum does not accept original materials without prior communication, review and approval from a Museum curator. Any unsolicited items sent to the Museum will be returned to the sender. If you have historic materials or art that you believe would complement AJM Collections, please use the form here to make a formal offer. Though the Museum staff reviews and responds to all submissions, we cannot always give these offers the prompt response they deserve. A staff member will do their best to review and respond to your offer once we’ve received it. We greatly appreciate your patience and understanding.